For ranchers in the Tassajara and San Ramon Valleys, fires were always a worry. In the early years ranchers, their families and their workers were the front line -- and sometimes the only line -- of defense, especially in the fall when no rain had fallen for months. For example, in September 1886, a fire at the Woodside Farm in Sycamore Valley wiped out the Woods’ entire grain crop and was fought unsuccessfully with buckets of water and wet gunny sacks. Volunteers organized to fight fires, beginning with the Danville Farm Defense Fire District in 1912. After trucks came into regular use, the firefighters kept water in milk cans on a trailer. The first volunteer to drive up attached the trailer to his truck and took off for the fire. In the Tassajara Valley fire suppression was provided by volunteers under the auspices of a huge district, the East County Fire Protection District. Rose Bettencourt Ferreira recalled that her family house burned down in August of 1923, saving only the barn and outhouses. She especially mourned the loss of their large collection of stereoptican slides and family pictures. A Mount Diablo fire in 1925 swept over 1000 acres, threatening homes at the Diablo Club. That fire was fought by 100 volunteers for over 18 hours. 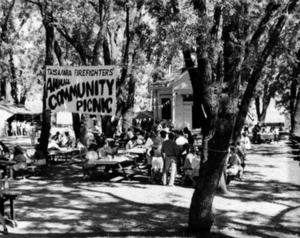 In 1969 Tassajara ranchers organized the volunteer Tassajara Fire Protection District, headed by a five-member Fire Commission. The District had a fire truck at Roger Lake’s house near the top of Morgan Territory Road and Station 36 at 6100 Camino Tassajara. By 1987 they protected 285 homes with an annual budget of $80,000. The Commission met at the Tassajara School House on Finley Road for which they took responsibility. Over the years the school had been saved with a new foundation and roof; renovations of the building continued under the auspices of the District and local volunteers. An annual picnic at the school sponsored by the District and the community gave residents a chance to see one another, hear a report from the District and raise funds to support school and fire district improvements. The District participated in the Twin Valley and other mutual aid agreements. Its volunteer organization and small budget was supported by contracts with San Ramon Valley Fire for dispatch services and with the Dublin San Ramon Services District for administration and inspection services during the eighties. Chief Phil Phillips of DSRSD was a mentor and advisor for the Tassajara volunteers who were supervised by Chief Warren Reinstein, followed by Chief Steve Eppler. 1. Install a full-time 24-hour per day, 7-day per week, paid force in Station 36. All volunteers who wish to remain active are welcome to do so. 2. Continue to support the volunteer force on Morgan Territory with training, new vehicles and an actual station. 4. Create an Executive Board composed of existing Fire Commission members to advise the SRV FD Board of Directors on issues of concern to Tassajara residents. Morgan also wrote that the change would not affect the tax rate and would not tie Tassajara to the City of San Ramon. This latter statement responded to activist Joe Covello who wanted to have a fire district which would serve only the city of San Ramon; he had served on the Dublin San Ramon Services District but did not speak for San Ramon’s Council. Covello charged that there was a hidden agenda and some kind of deal had been struck between the two districts. An angry SRVFPD Director Bill Blendow replied “I want you to know that we’ve never done anything under the table. How come everyone wants this but San Ramon?” The Local Agency Formation Commission (charged with district reorganizations), listened to the debate and voted unanimously to approve the annexation. 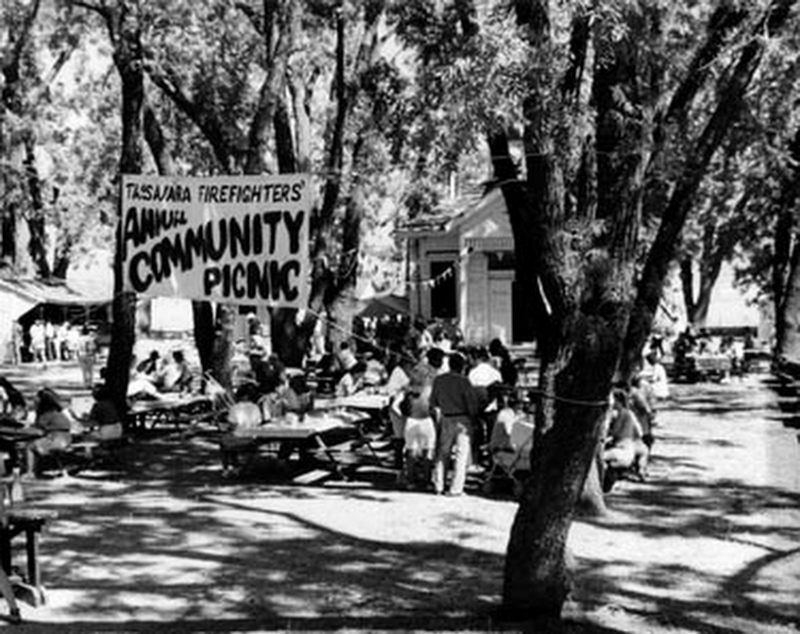 The Tassajara District annexed to the San Ramon Valley Fire Protection District in 1990, bringing their 35 volunteer firefighters and a responsibility for 325 homes and 40 square mile area to SRVPD. In 1997 the SRVFPD became the fire district for all of the San Ramon, Sycamore, Tassajara and Dougherty Valleys, including the Town of Danville, the City of San Ramon and the unincorporated county. Professionals and volunteers now serve the greater Tassajara Valley, many with fond memories of the historic Tassajara firefighter-volunteers.